I’ve always wanted to taste the food of Executive Chef Sean O’Brien ever since he was named one of the country’s Best New Chefs 2007 by Food & Wine magazine. 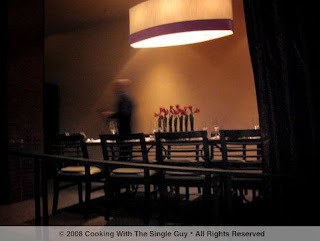 Then all of a sudden, Myth restaurant where he created his magic was sold in late 2007 and O’Brien was out of a kitchen. 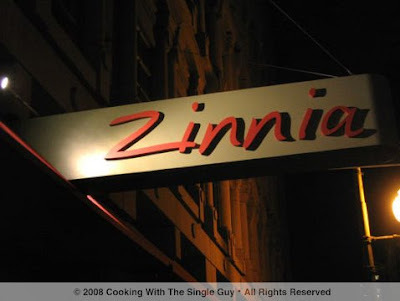 Zinnia is actually the former home of Scott Howard, another reputable dining establishment that also had a change in ownership. I’ve been to Scott Howard before and walking into the space now transformed into Zinnia, I really have to say that I still felt a sense of the Scott Howard ghosts. The layout hasn’t really changed, with a grand chandelier in the center dining room and banquettes around the perimeter. 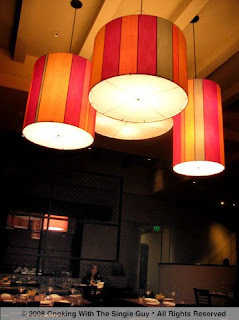 Michael Guthrie & Co., who did the refurbishing, added more whimsy with the multi-colored cloth lights in the center but it wasn’t a total transformation. The only really new elements are an elegant chef’s table adjacent to the kitchen and an interesting communal table at the bar. Chef O’Brien’s menu offers California-inspired dishes, with many of the pasta and seafood dishes provided in small or large portions. I like it when restaurants do that because then I can order the small versions and try more dishes. Foodhoe recognized a few items that Chef O’Brien served up at Myth, namely the seared sweetbreads and potato gnocchi. We both—for the briefest of moments—contemplated ordering the Black River Oscetra Caviar starter with Potato Cakes for $79, but thought better of ourselves. I actually started with the Seared Sweetbreads ($12), served with bacon and haricot verts in a light sherry vinegar sauce. It also came with a slice of toasted baguette on top, which I thought was out of place. The sweetbreads were amazing in texture and taste. The exterior was lightly crisp, giving the tender interior a light and pleasing feel. It worked perfectly with the sherry vinegar and bacon. This truly is a signature dish for O’Brien, showing the mastery of his simply designed dishes and expert execution. Foodhoe started with the Poached Jidori Egg ($11) with mushrooms and chicken hash, topped off with cracklings and chicken jus. It looked like a brunch dish to me, maybe because of the hash. 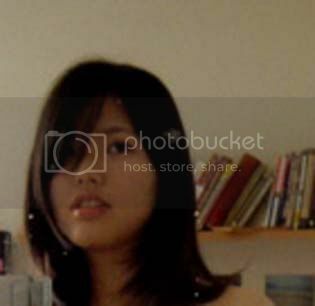 Foodhoe seemed to like the dish, but she wasn’t blown away. I think she was tempted to order it because of the cracklings, but she didn’t really rave about them after trying them. 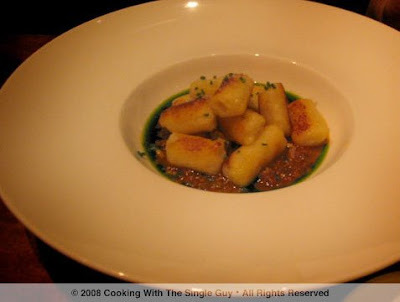 Next Foodhoe got the Seared Mascarpone Potato Gnocchi with Wild Boar Bolognese ($14). The gnocchi was a bit larger than what I normally see when eating gnocchi. They looked almost like tube pasta and they had a nice seared coloring on them. Foodhoe says she’s had it with a cream sauce, and preferred that to the Bolognese. I actually didn’t mind the Bolognese sauce, which was a rich and flavorful meat sauce. But both Foodhoe and I agreed that the gnocchi were a bit on the gummy side, almost as if they’ve been overcooked. 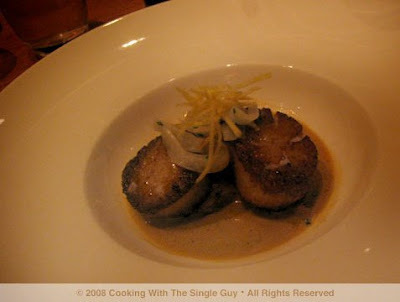 I had a small order of the Seared Scallops ($15/$26) with mushrooms, crispy potatoes, fennel and lobster sauce. I love any kind of seared scallops, but this dish was a little underwhelming. First, it looked awfully brown for some reason and the searing didn’t produce that nice, tasty caramelization on the scallops. It just made it looked brown bordering blackened. The sauce was rich, but didn’t have a distinct flavor other than cream. For our entrees, I went with the Quail ($17) stuffed with quinoa and king trumpets and served with arugula and orange slices. 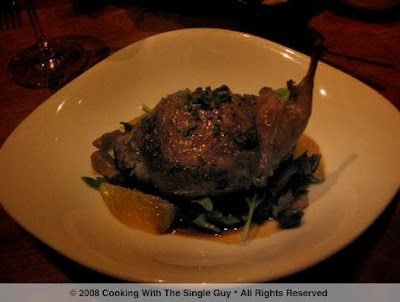 The quail was nicely prepared, with the bones so cooked that they basically broke away at each bite. The addition of the oranges gave it a bright, clean flavor but not something I haven’t tried before. 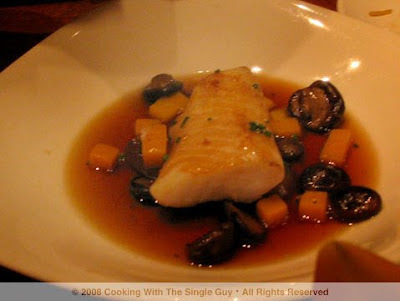 Foodhoe got a small order of the Roasted Alaskan Black Cod ($16/$27) served with baby shiitake mushrooms, butternut squash and sitting on a stewed piece of daikon (Japanese radish). The dish was finished off with a clear dashi broth poured on at table side. Foodhoe felt the fish was nicely cooked, allowing it to be tender and juicy. She loved the addition of the dashi broth, as did I when I gave it a taste test. The dashi was light and clean, which really helped to focus the attention on the meaty fish. Foodhoe wasn’t a fan of the stewed daikon underneath, but I thought it was fine. The dish probably could have done without it, but I thought it was just another flavor profile added in this Japanese-influenced entrée. We finished off our meal with a dessert recommended by our server: the Chocolate Marquise ($9). 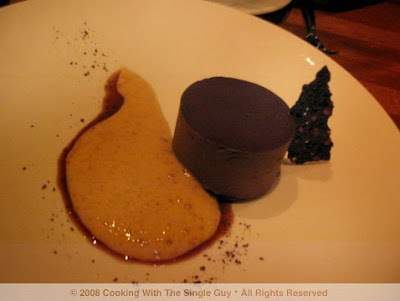 It was a mousse-like chocolate cake served with a caramel “air” (which is just like foam but more light, I guess). The chocolate mousse was delicious, with a creamy texture that was a perfect balance of airy and dense. I liked the accompanying “air” but Foodhoe had to spoil it for me by saying it looked like something her cat left behind. Side note: The service was friendly and attentive, but the timing of the courses seemed too spaced out. There was a lot of time in between our courses, which made our school-night dinner last more than two hours. I don’t know if this is a reflection of the opening month kinks in the kitchen or Chef O’Brien’s deliberate take to provide diners with the European approach to long dinners. I’m not a fan of long waits between courses, unless I’m on vacation. Chef O’Brien’s return is marked with moments of brilliance and a sense of being stuck in gear. Hopefully as he gets comfortable in his new digs, he’ll aggressively chart new territory in his cooking so diners can enjoy exquisite dishes like his sweetbreads and black cod with dashi. Let’s hope his stay is a long one. 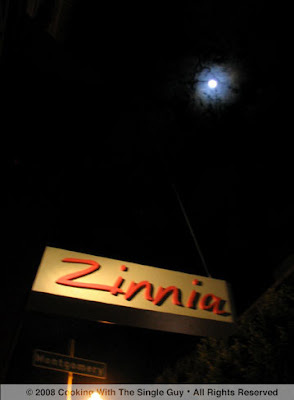 It was a beautiful evening as we left the restaurant, and being the shutterbugs that we are, Foodhoe and I got into a competition to see who could get a photo of the restaurant sign with the night's moon and the nearby TransAmerica building. I only could get two of the three. I have to say, that gnocchi looks absolutely to die for. lol your picture really makes that foam look like something my cat regurgitated! Dang, I'm still trying to donwload the pictures from my camera, what a slothful blogger I am... but I did enjoy reading about that meal and you brought up that daikon in the cod dish that I had completely forgotten about. Thanks for the memory jolt Chef Ben! Shall we try to get in for one of the monday nights with melissa perello at sebo? I'll let you know next time I get an email.